In 2004 I decided to take early retirement. However, I agreed to continue to deliver the popular introductory module "Planet Earth". 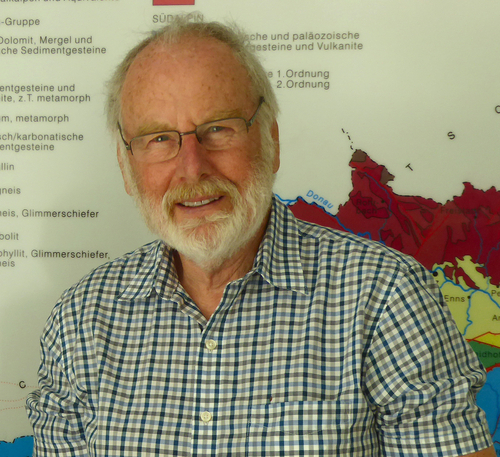 Over 40-odd years, my research career touched on a wide range of geological matters and took me all over the world. Much of it centred on how geological sediments (sands, silts, clays, etc.) respond to stresses and strains. Sediment deformation arises in engineered situations such as landfill linings and in a range of natural environments such as unstable slopes (especially on the seafloor), beneath ice sheets, and at the ocean trenches where Earth's plates are colliding. This latter situation led to my twenty year involvement with the international Ocean Drilling Program, and my investigating the deep ocean floor around the Pacific and Caribbean. Since retirement my research has shifted to a long standing interest: the supposed influence of vineyard geology on wine. I am currently finalising a book tentatively entitled "The Wine Lovers' Guide toGeology", to be published by Oxford University Press. Minerality in Wine: Towards the Reality behind the MythsParr, W. V., Maltman, A., Easton, S. & Ballester, J., 2018 , In : Beverages.4, 4, 77. Minerality in wine: a geological perspectiveMaltman, A. J., 2013 , In : Journal of Wine Research. Terrestrial glacial sedimentation on the eastern margin of the Irish Sea basin: Thurstaston, WirralHambrey, M. J., Huddart, D., Maltman, A. J., Crawford, K. R., Gonzalez, S. & Glasser, N. F., 2011 , p. 131-146. 16 p.